When the League of American Bicyclists released its annual rankings for Bicycle Friendly States this year, there was some shuffling among the states, as there always is, with some states gaining ground this year, and other states losing ground (my state, Oregon, fell from 3rd place to 5th ). The standout is Washington, which has held onto its first place ranking every single year, since the League released its first state ranking in 2008. One of the big success stories happened in a state that may not come to mind right away as a particularly bicycle-friendly state. This year, for the first time, Utah broke into the top-ten states, with an 8th-place ranking. To understand just how much Utah has achieved, consider this: just three years ago, Utah was ranked at 31st place. Clearly, Utah has done something right. To find out more about this remarkable turnaround, I talked with Utah bicycle accident lawyer Jackie Carmichael. Bob: Jackie, tell me a little bit about yourself. You’re a Utah bicycle accident lawyer. 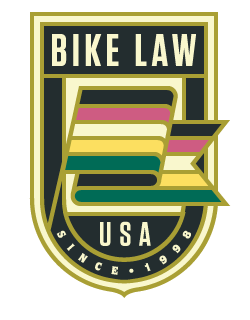 As I’ve said before, one of the things that distinguishes the lawyers in the Bike Law network is that we are all cyclists. Can you tell me about your interest in cycling? Jackie: About eight years ago my husband, who is an avid cyclist, gave me a road bike and encouraged me to get involved in the sport. Since that time, I have grown to love cycling as a way to stay fit and enjoy the beautiful mountains in Utah. I have many friends who cycle and we love participating in relays, mini-triathlons and other weekend races. Bob: What drew you to a law practice representing cyclists who have been injured in bicycle accidents? And how did you get interested in bicycling advocacy? Jackie: My law career has always been focused on helping people who are injured by the negligence of others. When I first started riding my bicycle around the city, I immediately noticed the perils that cyclists face from motorists who are too distracted to notice cyclists or are simply unwilling to share the road. This poses a huge safety issue for cyclists nationwide. I believe that bicycle-advocacy helps create awareness and also educates motorists with regard to how to share the road with cyclists so motorists and cyclists can co-exist without accident and injury. Along with bicycle advocacy, it was a very natural addition to start representing cyclists in my personal injury practice. Bob: You wrote about Utah’s bike-friendliness recently. I was curious about how Utah compares to other states, so I looked up the League of American Bicyclists State Rankings, and learned that Utah is ranked at Number 8 this year. And in fact, this is the first year that Utah has been in the Top 10, so congratulations on that achievement! Jackie: Thank you Bob! The State of Utah, and Salt Lake City in particular, has gone to great lengths to become a bicycle-friendly state. There are many, many bicycle advocacy groups as well as city planning committees who have been involved in creating the necessary infrastructure to make cycling a regular and permanent part of our community as well as making cycling available to those who want to participate. These groups include governmental agencies like UDOT and various State, City and County committees as well as private groups such as The Bicycle Collective. All of these groups have worked together to provide opportunities for cycling as well as to promote safe cycling throughout the State of Utah. Bob: I also noticed something interesting—in 2008, Utah was ranked at 11, then steadily dropped in the rankings each year until 2011, when Utah was ranked at 31. And then Utah climbed its way back, breaking into the Top 10 for the first time this year. Can you talk about that a bit? What caused the drop in the rankings? And what did Utah do to get to number 8? Jackie: I think awareness is the key. There was a big push in 2008 to promote cycling in our community and then gradually, over time, those efforts died down until Utah recommitted itself to the cycling movement in 2012. Since that time, there has been a flurry of activity to promote cycling in our state and to create more bike lanes, better infrastructure for safe cycling, and to raise awareness for bicycling safety. Bob: How important is bicycle-friendliness to the State? And to Salt Lake City? Jackie: Bicycle-friendliness is very important to our State in general and to Salt Lake City in particular. Salt Lake City’s mayor has declared May “Bicycle Month.” To that end, there are many cycling activities that occur in May including symposiums as well as planned rides, an official “ride your bicycle to work” day and many other fun events that promote the cycling movement. Additionally, Salt Lake City’s law enforcement has created Guidelines to facilitate its enforcement of Utah’s bicycle safety laws in order to promote safe-cycling and help avoid accidents between motorists and cyclists. Bob: Why do you think that is? Jackie: Utah has a large population of health-conscious individuals who love to enjoy the great outdoors. Cycling is one of many ways that Utah’s population gets out there to enjoy the beautiful scenery of our State. Because of Utah’s enthusiasm for cycling, running and other outdoor sports and activities, the state has focused a lot of resources and efforts into making our State a safe and fun place to ride a bike. Bob: You mentioned Bike Utah and Bike SLC in your article. Can you tell me about those organizations? Jackie: Bike Utah and Bike SLC are two great organizations who do a lot to promote the cycling movement in our State. Both groups have websites that provide Utah residents with valuable information regarding safe cycling as well as bicycle routes, races, recreational rides and other cycling opportunities. Bob: What about other cycling organizations in the state? Is there a statewide advocacy group? Local advocacy groups? Jackie: As I’ve mentioned, we have The Bicycle Collective whose main goal is to provide more people with cycling opportunities. The Bicycle Collective is an awesome advocacy group that provides refurbished bicycles to the community—particularly to children and lower income households. The Collective also provides educational programs to the community regarding cycling and promotes cycling as a form of transportation and a means to have a cleaner, healthier and safer society. The collective accepts cash donations as well as donated bicycle parts and invites members of the community to give volunteer hours to the cause. Bob: There’s a lot of interest among cycling advocates across the country in advancing new bicycle safety legislation. Some of the laws that cyclists are working on getting passed include “Three foot safe passing” laws, “Vulnerable User” laws, and anti-harassment laws. Can you tell me about some of the bicycle-friendly laws in Utah? Jackie: Utah has had a three foot safe passing law in place for many years. As of July 1, 2013, 6 new bicycle safety laws were enacted including two that allow motorists (who want to pass cyclists going at slower speeds) to cross the double yellow lines and use the opposite lane and/or a left turn lane to pass the cyclist. In making this allowance, the legislature is allowing the cyclist to continue in his/her lane of travel instead of being forced into the shoulder of the road by a passing vehicle and is requiring the passing vehicle to give a wider berth to the cyclist as it passes. Another law allows cyclists to proceed with caution through a red light after waiting 90 seconds and it is clear that the light is not detecting their presence. Yet another law allows cyclists to pass on the right of another vehicle if they can do so safely. These are all bicycle-friendly laws that will hopefully improve cycling safety in Utah. Bob: Utah’s “Vulnerable User” law actually seems to be more of a hybrid between a vulnerable user law and an anti-harassment law, because it criminalizes harassment that results in bodily injury. Can you talk about how—and why—Utah’s law is different from Vulnerable User laws and anti-harassment laws in other states? Is there any interest in the Legislature for addressing harassment that doesn’t result in bodily injury? Or for protecting cyclists who have been seriously injured or killed as a result of a driver’s carelessness? Jackie: You are absolutely correct that Utah’s Vulnerable User law currently only criminalizes harassment of cyclists if the harassment results in bodily injury. Under this law, the harassment contemplated includes any intentional, knowing or reckless attempts to distract a vulnerable user of a highway or force them off the roadway if those actions result in bodily injury to the vulnerable user (cyclist). I believe this law is step one in the process of having our Legislature eventually criminalize harassment of cyclists even if the harassment does not result in bodily injury. With regard to protecting cyclists who have been seriously injured or killed as a result of a driver’s carelessness (as opposed to their intentional or reckless conduct), those claims are handled in our civil judicial system where citizens can bring claims for the harms and losses they suffer as a result of the carelessness of others.These are precisely the types of claims that my firm specializes in handling on behalf of injured cyclists. While it is often times impossible to help an individual return to their pre-injury condition, if we are able to provide our injured clients with resources to improve the quality of their lives and get them the medical and rehabilitative care they need and deserve, we feel a measure of success. Bob: Yes, I agree. While I always hope for a full and complete recovery for my injured clients, at a minimum it’s essential to make sure that they get the medical and rehabilitative care that theys need, and the compensation that they are entitled to. And I’m sure we would all like to see legislation that leads to safer conditions on the roads, so that debilitating injuries are prevented in the first place. Getting back to legislation, some other issues that cyclists are concerned about are “dead red” laws (allowing a cyclist to proceed through a red light if it does not detect the cyclist), “Idaho stop” laws (allowing a cyclist to treat a stop sign as a yield sign, and a red light as a stop sign), and “Pass on the right” laws (clarifying that it is legal for a cyclist to pass other vehicles on the right). What is the law on these issues in Utah? Jackie: Utah’s cycling laws are very clear and concise that a bicycle is considered a vehicle and cyclists have the same rights and must obey the same traffic laws as motorists. In other words, all of the laws that pertain to motorists pertain equally to cyclists. There are a few exceptions to this general rule in Utah including our own “dead red” law that allows cyclists to proceed through a red light after waiting 90 seconds if it is clear that the light has not detected them. Cyclists are also allowed to pass on the right of a vehicle if they can do so safely. While these two exceptions to Utah’s traffic laws exist for cyclists, Utah does not have an “Idaho stop” law that would allow a cyclist to treat a stop sign as a yield sign. Bob: It’s good to know that Utah law allows cyclists to pass on the right.In 2009, a cyclist was successfully prosecuted in traffic court in Logan, Utah for passing on the right (a misdemeanor in Utah). Hopefully, law enforcement and the courts are getting the law right now. And that brings me to something you wrote about in your article. You mentioned efforts by law enforcement to educate its officers. This can have such an enormous impact on everything from traffic citations to accident reports. There have been many, many examples across the country of law enforcement getting the law wrong, with sometimes very serious impacts on justice for the cyclist. Another problem area is when law enforcement officers equate bicycle safety enforcement efforts with crackdowns on cyclists, while ignoring illegal and dangerous behavior in motorists. Can you talk about law enforcement education efforts in Utah? Jackie: The State of Utah has created the “Bicycle Safety Enforcement Action” (“BSEA”). The purpose of BSEA is to increase safety for bicyclists through education and the enforcement of traffic laws. The leaders behind BSEA believe that law enforcement is an important part of bicycle safety and that more reliable and consistent enforcement of Utah’s bicycle laws can reduce violations and start to change negative behaviors towards cyclists. The BSEA program was created “to raise awareness among law enforcement personnel of the need to actively enforce bicycle safety laws, as well as reach out and educate motorists and bicyclists of the proper way to share the road.” The BSEA is conducted by law enforcement officers to proactively enforce traffic laws relating to bicycle safety. Much like a speed enforcement action, the BSEA increases awareness of bicycle safety laws and the rights and responsibilities of both motorists and cyclists on the road. Bob: That’s an interesting program—it seems to be very even-handed in its approach. Let’s talk more about traffic safety. You wrote that the Salt Lake City area has an average of 239 auto-bicycle crashes per year, and said that “one might ask what more can be done to decrease the number of car to cyclist collisions?” What do you think could be done to bring that number down? Jackie: Two things can be done to improve traffic safety for cyclists in Salt Lake City. The first, of course, is to continue to educate the public regarding bicycle safety laws and the responsibilities of motorists and cyclists to share the road. The second will involve continued development of Salt Lake City’s cycling infrastructure to include dedicated cycling lanes that will keep cyclists out of harm’s way. Bob: We’ve talked about “Bicycle Friendly Utah.” What do you think could be done better? And what’s urgent right now? Jackie: I think that while Utah has made excellent strides towards creating an infrastructure to support safe cycling throughout our state, there are still many areas that leave cyclists vulnerable to motorists and severe injury or death from collisions with vehicles. It is my understanding that several organizations throughout our state are currently working on several projects that will improve our infrastructure for cyclists and will add additional bike lanes as well as dedicated bike lanes that will greatly improve cycling safety in the state of Utah. Bob: Do you have any specific bicycle accident cases that you want to talk about that you feel would have turned out differently for the cyclist had there been improvements in safety? Jackie: The cycling cases we have handled involve a myriad of negligent actions, shortcomings, failures and oversights that caused our clients serious injury and even death. Improvements in safety would have eliminated all of these injury-causing problems without exception. In one of our cases, the bicycle manufacturer designed a defective tire rim that collapsed during a bike ride causing the rider to pitch head first over the handlebars and become paralyzed from a severe spinal cord injury. In another case, a woman was killed when she hit a construction sign that was left in a bike lane and was placed at an angle that made it difficult to see and appreciate until it was too late for the cyclist to adjust her course. Another example is the case of a man who commuted on his bicycle to work every day and was hit by a distracted and negligent driver. This cyclist was seriously injured to the point where he was unable to return to work for many months and required surgical repair of his injuries. These are just a few examples of some of the cases we have handled for injured cyclists. In each instance, it is easy to see that observance of bicycle safety laws and the manufacture of safe bicycle components would have prevented the injuries and death that occurred.